Today is Labor Day, marking a transition in the year and the pace of my life. The fall semester starts tomorrow, which means I’m equally excited to start my study of Food Anthropology with Carole Counihan and US Food History with Warren Belasco — and fearful that I might be crushed beneath the weight of my academic course load, working full time, studying for the cursed GRE, and applying to PhD programs. What this means for you is that I’ll happily continue blogging, but likely only once a week. So please do continue to visit me, but know I’ll only be posting new content on Mondays — like today! Drive (2011), directed by Nicolas Winding Refn, turned out to be a film that viewers either adored or loathed. My husband and I were in the adoring camp — and not just because we both have huge crushes on the Gosling. 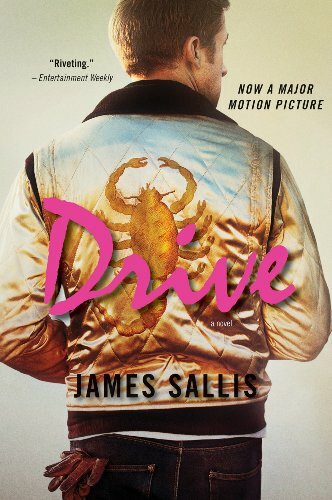 After seeing the film, we read James Sallis’ novel by the same name on which the film is based. As is always the case, the novel provides far more context and depth to the character of Driver. The role of food in the final scene also struck me. In the novel, after many deaths have occurred, Driver’s antagonist, Bernie Rose, invites him to dinner. They meet at Warszawa, a small 1920s Craftsman bungalow with hardwood floors, large, double-hung windows, French doors, and lace curtains converted into a Polish restaurant — an unexpected setting for a meeting between two violent men settling some very bloody business. [In all honesty, it sounds a lot like the restaurant where we had our wedding reception]. The irony does not end there. When Driver arrives, Rose has already started drinking wine, a Cabernet-Merlot blend, revealing himself as a bit of a wine connoisseur. As he pours a glass for Driver, he shares his wine knowledge, commenting on the current state of the wine industry and the new wines coming in from Chile, Australia, and the American northwest. Notably, the first words shared during this meal are not about the murders that have taken place or the uncertainty of these two men’s future, but about wine. As occurs in many mafia movies, Rose is passionate about food, as we can see in how he describes a menu that he has enjoyed for nearly two decades. The phrase “to die for” seems a bit odd coming from a boss of organized crime, but perhaps it is meant to create trust, intimacy, and rapport with Driver? They both end up ordering the duck, though Driver wonders if he has ever in his life eaten duck before. It is a new gastronomic experience for him, but one that he enjoys. As Driver meets with the man responsible for ordering multiple attempts on his life, Rose is also Driver’s Virgil on this journey in fine dining. Using the language of driving, which guides most of the narrative, Sallis describes their after dinner experience as “cruis[ing] into coffee and cognac” (p. 155). Following the meal, they leave the building and walk to their cars. But when they reach to shake hands, [SPOILER ALERT!] Rose holds a knife intent on killing Driver, but Driver is able to instead kill Rose. This ‘last supper’ is not included in the film adaptation. 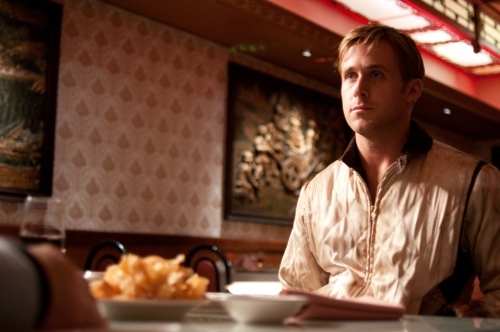 Driver and Rose instead meet in a large and ornate Chinese restaurant with heavy red hues, where they do not eat or drink, and only discuss business. What does it mean for these two grave enemies to share a meal together, discussing only pleasant, and often gastronomic, topics? It is relevant that Rose invites Driver to a small, family-run restaurant at which he has dined himself many times. Is this a hospitable action? Is this a moment when a mature gangster shows a young buck one good meal before he plans to kill him? Is this meal a gift? A farewell? A long, slow warning? A theme I’ve observed in other films, such as Pulp Fiction and A History of Violence (check out my blog post on food in A History of Violence here), is that food can serve as an “appetizer” of sorts for scenes of violence. Is this meal thus a sensory lead in for the violence that follows; a similar yet different engaging of the senses? I’m obviously still chewing on the meaning of this ‘last supper,’ but you’re welcome to join in my ruminating — and to enjoy the film. If nothing else, you’ll get a delightful dose of Ryan Gosling through a food studies lens or otherwise.